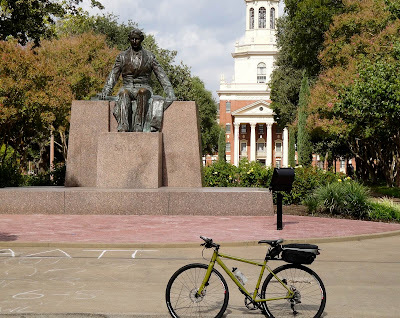 I had scouted the Woodward/McGregor Loop on my first afternoon, Oct. 5th, in Waco TX, and got up bright and early the next morning to get some Lone Star miles under my big-buckled belt. But no. The tire pressure light on the mini van's dashboard dashed my day. Turns out I had to spend all morning getting 3 very troublesome tires replaced. Needless to say I rather stood out in the customer lounge in my bright yellow jersey and riding pants. But we got 'er done and I was left with about 45 minutes to explore Waco before heading off to my next place. 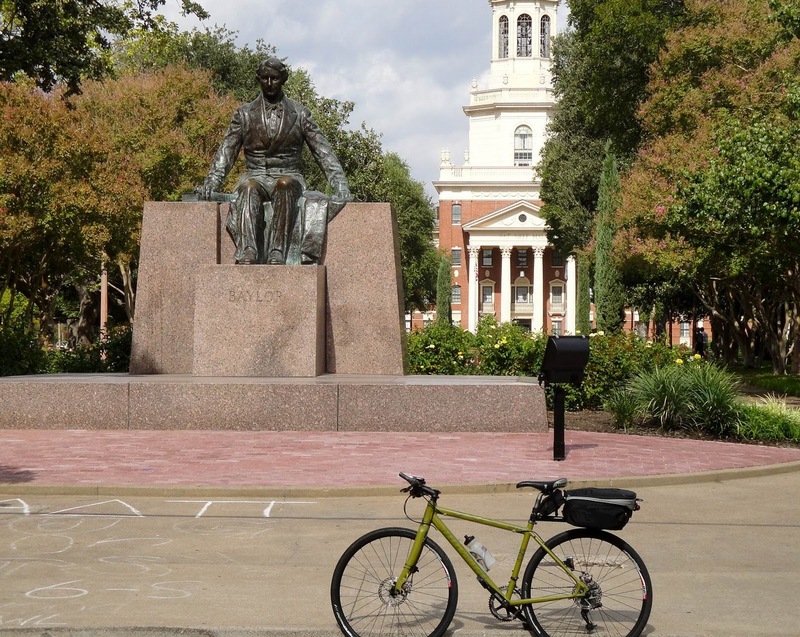 That's right, I drove to the Baylor University campus, slid the mini-van in a 15 minute parking slot near the bookstore, pulled out the Novara Jazz and took a spin around as much of the place as I could cover in a quarter hour. Managed to snap this pix of the founder and one of the beautiful classic buildings. The University has a sweet vibe that comes across quickly. The students look sharp and busy. I toyed with the idea of trying to find the site of the Branch Davidian compound that was torched by the ATF in what became a great embarassment for Janet Reno and of course cost some lives. Come to find out that the site has been completely "erased" from the face of the place and some nondescript use is being made of it. It is a topic that is simply not discussed by Wacovians. Had a lovely time and relaxing dinner with my cousin Janet and her husband Joey Allen who drove up from Corpus just to say howdy; and our mutual friends Mike and T-9-E Cooper who live in Salado. (She has been called "Teeniny" since birth - turns out there are various spellings of that name.) Had a really fine visit with them and now have a new understanding of the real estate term, "hidden jewel." Historic Salado is more jewel than hidden - put it on your list of future pleasant surprises. Our efficient departure on Friday morning did not leave time for a photo and I'm sad about that.